The Royal Opera House's Firsts season, pulling together short work from dance, physical theatre and circus, is becoming an important stopping point for circus graduates: a chance to rethink and extend degree material, and a bridge between cabaret work and the very distant and distinct prospect of a full-length stage show. Gemma Palomar (previously a part of my favourite hip-hop circus crossbreed The Silver Tree) presented her piece Silence to feel, a Chinese Pole solo that sets silence and stillness against the rush and noise of life, choreographing an organic, breathing movement between the closed and the open—tight in-turning spirals alongside drops and big, extravagant flares. It is, in one sense, a very focused piece. The shape of the lighting, the central magnetism of the pole itself, and the traceable lines Gemma draws as she moves across the stage create a compelling sort of arena—a bounded circle, and a space of silence and intense concentration that lies close to the heart of what I think the piece wants you to feel. Silence is least coherent when it tries, intentionally, to break out of that state or reach beyond it. It’s either awful or entirely appropriate that the piece makes the least sense when it communicates directly—Spanish and English language speech meshes with and overlays the performance, and while the unpacked meaning and intuited value of the Spanish does good work, the English sections feel at once too explicit and too poetically abstract. A few times, as well, the house lights come up and Gemma stares the audience out—a moment of connection that, truthfully, doesn’t feel so authentic, and ultimately doesn’t find its mark: even though the audience are told that it’s their silence too, and are thanked for their silence, the houselights haven’t even ended their slow fade to black before the theatre erupts in tumultuous applause. 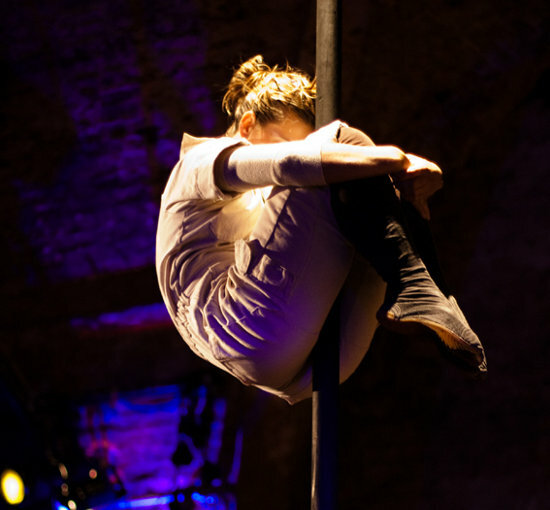 None of which, though, should be taken as failure, because Silence to feel is a fascinating addition to the subgenre of introverted circus, exactly the sort of thing Firsts should be putting on, and further proof that Gemma is a brilliant, brilliant technician. Nerdy mouth-breather Jonathan Young brought an altogether different style of Chinese Pole performance—with thick NHS glasses and long-term postural problems he begins Dancing Like No One’s Watching, embarrassing dance steps and gyrations giving way to explosive Pole acrobatics. It’s a common enough strategy, implanting high skill in an everyday character (the apotheosis of the acrobatic take on the genre being the old man who covers scene changes in ebullient Korean martial arts import Jump), and it seems a little strange programming DLNOW, which is very much an Act, in a season like Firsts—but I suppose the attraction was in the contrast between it and Gemma’s piece, and possibly they just wanted to give the audience some fun going into the interval. The night I was there Jonathan wasn’t quite nailing his tricks, which I guess you could argue is in line with the premise of the act, but I don’t know—I think he wanted to nail them. In the end he made up for it with a series of travelling pelvic thrusts and got the biggest audience reaction of the night. People can relate. I saw Collectif and then... at Bristol's Harbourside Festival earlier this year, and felt at the time that the piece they presented had shed some critical weight in order to appear in an outdoor format. On stage, at length, fully audible, A view from down here is funny and warm, interested and resolutely outward-looking. It begins with Lucie N'Duhirahe braiding Francesca Hyde's hair—Francesca hanging upside down and talking constantly, lightly, about whatever's on her mind: the performance to come (she likes the gazelles because they're easy but satisfying), what happened on the bus the other day, whether she should have been to the loo beforehand, and how Lucie shouldn't pull on her hair because she hates it when people pull on her hair (finishing the braid, Lucie of course takes a quick swing). The two go up to the ropes, a double cloudswing, and never really lose that starting mood—they talk to each other to coordinate tricks, and if you care to imagine Jessica Stevenson doing cloudswing you might get a little of the way to Francesca's aerial style. As they move through their routine, letters float down from the ceiling. Written by children and read in voiceover, a couple are about Jimi Hendrix ('so interesting') and Bob Dylan (not so great), and a few are addressed to Barack Obama, one suggesting that he pull all the troops from Afghanistan and commit them fully against Brian Murphy ('I know Bin Laden is bad, but even he wouldn't want a wedgie from Brian Murphy'). The letters are sweet of course—kids say funny things—but their real influence is in situating A view from down here in a context of sociability: it's friendly in the sense that it searches out resonance and sympathy, not grand or spectacular apartness. I don't think the piece makes much headway into its stated intention—to 'explore some of the grave mistakes we make as adults, and how this affects future generations'—but it's doing a lot else besides, and when the pace of the aerial routine kicks up, the audience go with it, accepting a slightly choppy recut of a sunny Four Tet track, obviously wanting to be a part of a performance that wants to be a part of everything. A view from down here is a great piece—gently provoking, playful but not slight—ending, appropriately enough, with a hairhang and the hairhang's unavoidable, default expression: raised eyebrows.